A TRIBUTE TO THE MEN WHO FLEW THE MOSQUITO. 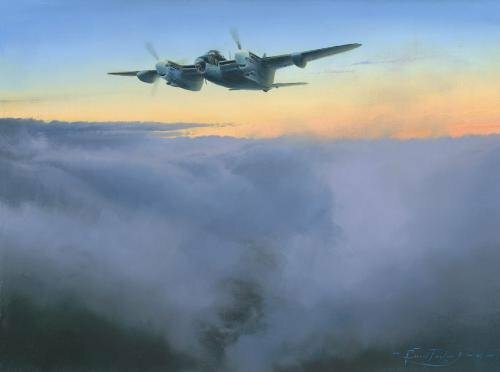 Completing a record 213 operational sorties with Bomber Command’s Pathfinder Force, Mosquito LR503 became one of the most successful aircraft in the Royal Air Force during World War II. It flew first with 109 Pathfinder Squadron, and then 105 Pathfinder Squadron, completing more combat missions than any other Allied aircraft. The editions are signed by eminent RAF & RAAF airmen who flew the Mosquito during WWII, and represent not only Bomber Command, but also the men of Coastal and Fighter Commands. Each print is signed by the artist Robert Taylor, and hand-numbered. With all the signatures of the RAF Edition, these EIGHT signature Proofs are additionally signed by the RAF’s top night-fighter Ace, and matted to include the original signatures of two of the RAF’s most highly decorated and respected Mosquito pilots. The two signature RAAF edition is signed by RAAF Airmen who both flew Mosquito LR503 with the Pathfinder Force.